Small caps fonts are designed in a way that an uppercase letter (capital letter) has the same height and weight as a normal lowercase letter like a,c,x,m etc would have. More exactly, it is designed slightly larger than the lowercase x-height. In typography, an x-height refers to the height of lowercase letters that have no ascenders and descenders. As in Latin alphabet, the lowercase X has horizontal serifs at both top and bottom so the height of X is used as the measurement. Small caps, like italics or bold, is another way used in texts to show emphasis or distinctiveness. A lot of word processors like Microsoft Word have small caps option in the software, but if you simply use that option, you may not get true small caps. As the software itself only converts lowercase letters to small caps, so the weight of lowercase letter leaves, which is usually lighter than a uppercase, making the text in small caps look out of proportion. So the right way to achieve a small caps style is to use a font that has small caps character set. As every small capital letter is designed with proper weight, kerning etc compared to capitals, making the text balanced, strong and comfortable to be read. Tahoma Small Caps is a typical font family in small caps style, which contains two fonts: Regular and Bold. To download free small caps fonts, you can take a look at our free fonts collection, which offers more than 20,000 fonts in different categories. If you are looking for small caps fonts that are of high quality (well kerned, broad character support, etc. 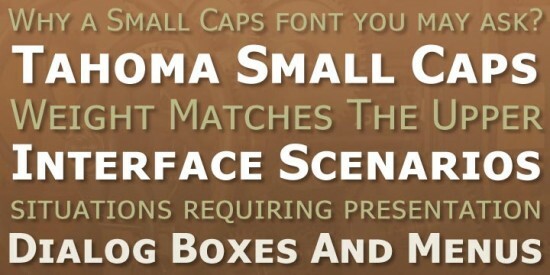 ), have a look at small caps fonts at myfonts.com. If you don’t want the hassle of downloading and installing fonts, but just need simple designs in small caps fonts. Check the tool below. Below is a collection of small caps fonts. You can use the following tool to generate text images based on your selection of colors, sizes using small caps fonts in seconds. To download the image, just right-click on the image and save. To embed images on web pages or forums, you can click on the "EMBED" button to get codes.